Provide a critique of each of the following pieces of work. Provide constructive feedback and action items that would allow a junior to mid level designer to improve or adjust their work. Let's bring the word "Wearing" down to the next line to allow the title to read more evenly. I think we're missing an opportunity here by requiring the reader to click on the image in order for the look to build. Let's have this automatically happen on hover. This note applies to all three looks in the story. Here's an example of a solution for the note above. The image would animate as soon as the reader hovers over it. I don't love the way these images overlap due to the way the product (handbag) is being cut. There may be a more intentional way of doing an overlap! For example, maybe we can adjust the order of the images. If that doesn't work, let's remove the overlap and lay out the images in a different way. I like the concept of showing aspects behind the scenes throughout the story. I think for this intro image, we should try to find a shot that is more clear and recognizable. I'm not sure everyone will quickly be able to place what's in that image. Do we have any images of lights? If not, let's start with the image of the wheels here. Let's have some more fun with this intro! Try removing the gray overlay and playing with the typography & layout of these first two images. Our goal is to really capture the reader's interest at the initial glance. This first set of images doesn't really catch my eye. Maybe we can adjust the layout or switch the order so that the lower group of images comes first. These two captions feel like they are floating unintentionally. Let's move them closer under the images so that the reader can easily connect them to the photos. Something odd is going on with the type here. "Intimidate" seems slightly smaller than the rest of this header. Let's make it the same size so that it is easier on the eye. Right now it's not enough of a difference to seem intentional. Additionally, if you'd like to play with another type of display font for these call outs I think it might be fun and add more flavor to your design. Let’s space this out more evenly so that the answer is closer to the question it refers to. Right now, the answers are visually closer to the wrong question. This is an example of how I might edit with the above elements. 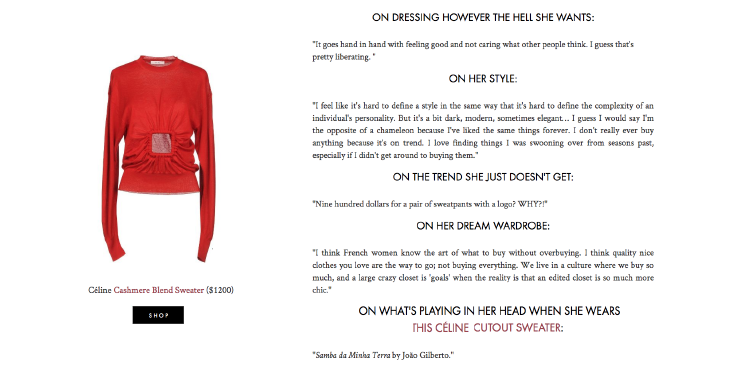 Let's adjust the type for "This Céline Cutout Sweater" to be on the same line. As the reader scrolls, this sweater floats with too much negative space. Let's move it to be more dynamic with the story. Let's also align the shop button and the description to be more visually centered. This is an example of how I might play with the above elements. 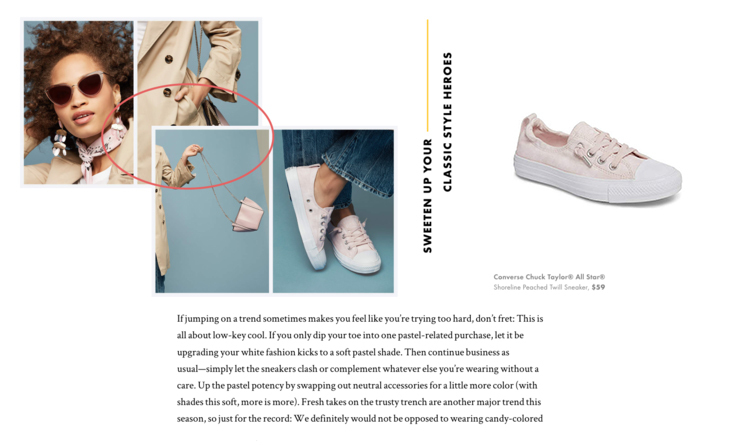 I love the way you are using animation with the type in this story, it's a great way to stay dynamic and utilize our online platform. Similar to my comment about the last web page, let's have some more fun with this intro! We can play with the type and layout of images to capture the readers right away. Many of the photo credits on this page are floating a bit awkwardly far from the photo. Let's move them closer together so it's easy to connect the two. I love your idea of playing with the typography here. Let's adjust the spacing a bit (either move "is your blowout?" up or move "wait how" a bit more to the left) so that the spacing is more aesthetically pleasing to read. I like the idea of doing an image overlap for the product shots. For this one, I don't love how the background image is so similar. Can we do something that's a bit more different?